French Amb. 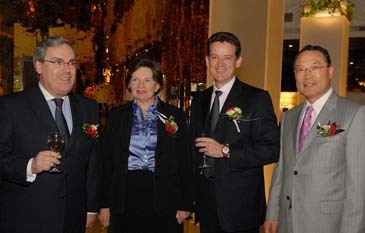 Philippe Thiebaud (left) poses with his wife, Mrs. Francoise Thiebaud, Mr. Jerome Stubert, general manager of Novotel Ambassador Gangnam, and Mr. Parkl Han-Kee (right), general manager of Sofitel Ambassador Seoul at the opening dinner for "French Gourmet Festival" held on Oct. 8, 2007 at the Novotel Ambassador Gangnam. The opening dinner for "French Gourmet Festival" was held on Oct. 8, 2007 at the bistro of Novotel Ambassador Gangnam. Hosted by the general manager of Novotel Ambassador Gangnam and GM Delegate for Accor Korea, Mr. Jerome Stubert, the event was participated by a number of VIPs in French community in Korea including Mr. Philippe Thiebaud (The French Ambassador to Korea), Mr. Anthony Chery (Conseiller Economique & Commercial of French Embassy), Mr. Philippe Li (President of FKCCI), Mr. Philippe Barbieri (General Manager of Air France Korea), Mr. Philippe Esnault (Managing Director of Renault Samsung), Ms. Myong-Joo Im (Director of Sopexa Korea) and some journalists. Kicked off with cocktail reception at the lobby lounge, the dinner was especially celebrated by representatives from five Accor-Ambassador hotels along with the representative of Sopexa and the French Ambassador to Korea, who joined the tape-cutting. The feast included special course menus with wine from Alsace, France. Featured dishes are assorted cold cut sausage, salad, Trout pan fried with almonds and new potatoes, Ribeye beef steak with black cracked pepper corn sauce, Jugged deer cooked in red wine and more. "French Gourmet Festival," which is held from October 8 to 21 at five Accor-Ambassador hotels with sponsorship by opexa, brings the finest selection of cuisines and wine from five largest wine-producing cities in France : Loire at Sofitel Ambassador Seoul, Provence at Ibis Ambassador Myeong-dong, Alsace at Novotel Ambassador Gangnam, Bourgogne at Ibis Ambassador Seoul and Bordeaux at Novotel Ambassador Doksan. Various prizes are also available at the end of event including a free round-trip to Paris.